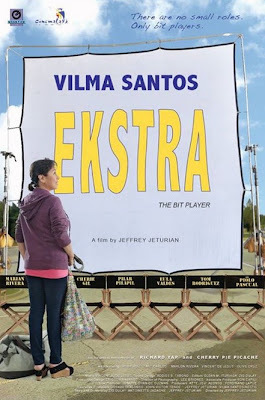 Ekstra (The Bit Player) is a 2013 Filipino socio-realist drama-comedy film by Jeffrey Jeturian. The film stars Vilma Santos as Loida Malabanan, who spends her days dreaming of her big break while working with the country’s best small screen actors.The film is competing under the Directors Showcase sidebar of Cinemalaya 2013. A socio-realist drama-comedy ﬁlm, it follows a seemingly usual day in the life of Loida Malabanan (Vilma Santos) as she embarks on yet another shooting day of a soap opera as an extra. As the shoot goes on, we get a glimpse of the truth in the ruling system of the production as well as the exploitation of the marginalized laborers like her.